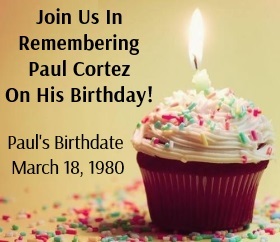 On September 10, 2008, Toni Marie Angeli filed a federal appeal on behalf of Paul Cortez with the United District Court for the Southern District of New York. The filing includes newly uncovered video evidence that shows David Haughn (not Paul) leaving the apartment minutes after the time of the murder. This powerful, uncontroverted, time stamped piece of evidence contradicts David’s trial testimony as to his whereabouts that evening and squarely places David in the apartment during the time of the murder. As further evidence of his trial attorneys ineffective representation, although this video was in their case files, they did not present it at trial. Did Paul’s trial attorneys and/or the prosecutor even watch this video? Among the many expert findings included in the federal appeal are several reports from forensic experts showing that the critical “finger print” relied on by the prosecution at trial to link Paul to the murder was left at a time before the murder. You can read the full appeal by clicking the link above.